Traditional zucchini fritters are usually deep-fried to crispy perfection, but with this easy baked zucchini fritters recipe, you can enjoy them without feeling guilty at all. They’re super healthy and easy to make, and still have that lovely crisp texture! I love fried zucchini fritters, but what I love more is their healthier counterpart *mainly because I can have more than 3 and don’t feel guilty about it*. This baked version is very easy to follow and a light spray of oil is all you need to get that golden crunchy crust we all love, and keeps the fritters soft and moist on the inside. 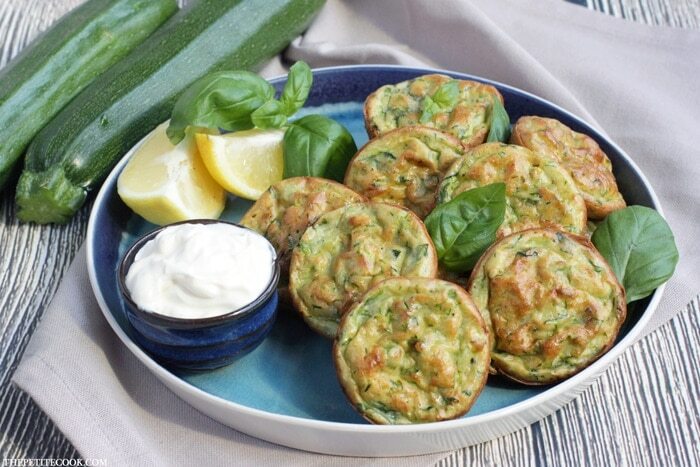 Vegetarian, dairy-free and gluten-free, low in fats and calories, these baked zucchini fritters are also super versatile – one of those recipes you can have for breakfast, lunch, dinner, snack-time OR serve as finger food at your next party! 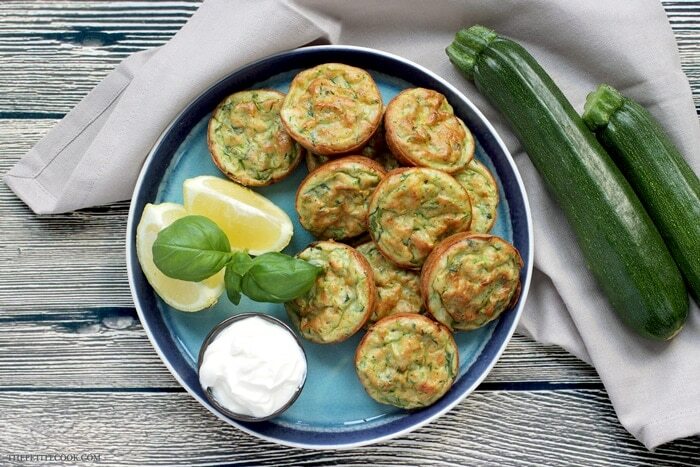 Making these delicious baked zucchini fritters is such a breeze, it takes just 20 mins start-to-finish, and you only need is 7 simple ingredients: zucchini, free-range eggs, whole wheat/plain/gluten-free flour, lemon zest, baking powder, spring onions and your favorite fresh aromatic herbs such as basil or mint leaves. 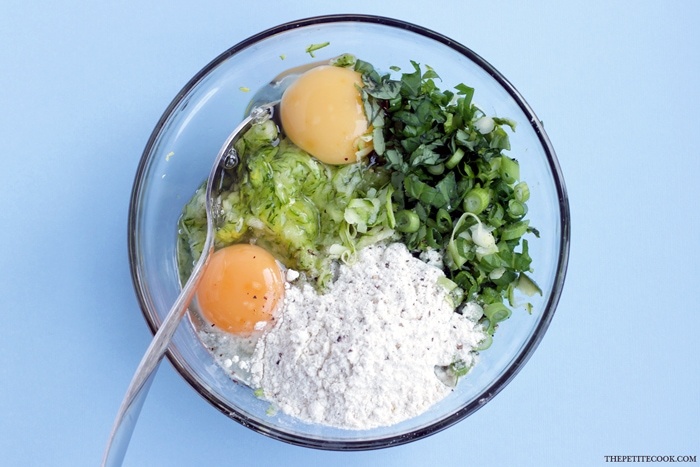 The recipe is easy-to-follow and totally stress-free. Start by grating the zucchini and sprinkle with a pinch of salt, it helps keep your fritters puffy. 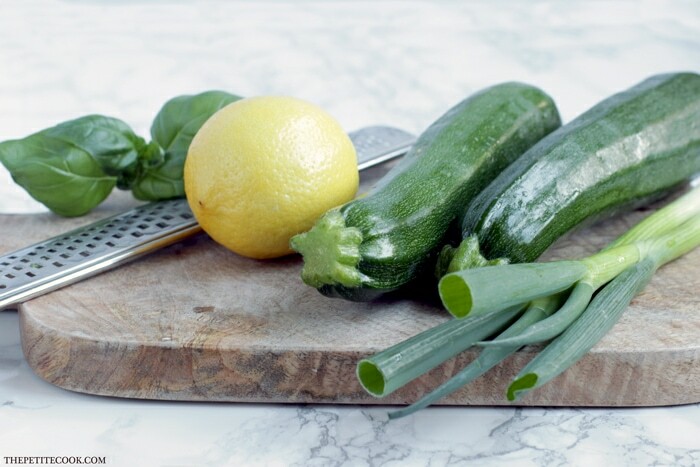 Put the grated zucchini in a clean kitchen cloth and make sure to squeeze out their excess liquid. It will help keep the fritters nice and crisp. Then all you have to do is fold the zucchini in a bowl and mix together with the remaining ingredients. 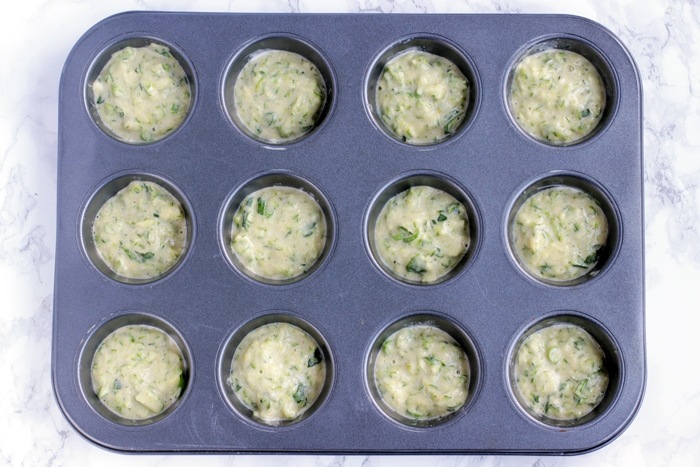 Divide the mixture among a mini muffin tin sprayed with oil. 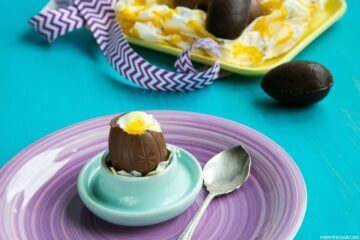 I usually pour 1 full tablespoon in each mould and the batter is just enough to fill a whole 12-cup tin. Bake until golden & crisp, and get ready to devour them all up! 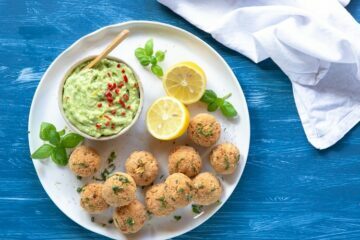 Serve these tasty baked zucchini fritters alongside some homemade mayo and a wedge of lemon for a healthy, crispy snack the whole family is sure to love. 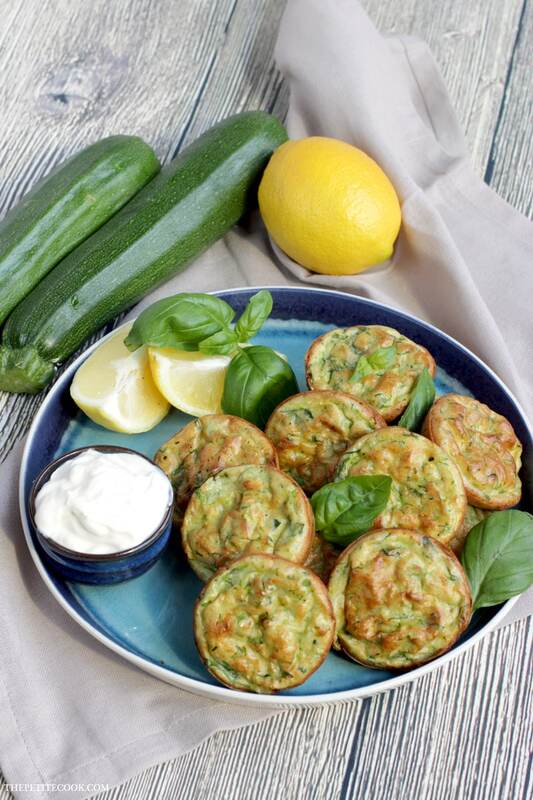 I hope you guys will give these awesome zucchini fritters a try! So many of you asked for it on my Facebook page, so I’m sure these fritters will make you happy. Don’t forget to leave a comment below and let me know how you liked it! Even better, snap a picture, tag it #thepetitecook and share it on Instagram! 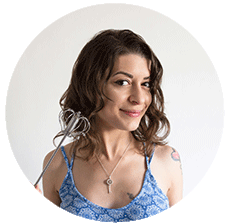 I can’t wait to see all your delicious creations :). Delicious thanks Andrea – would they be OK to freeze? Hi Alan, absolutely! I’ve got a batch in my freezer as we speak 🙂 I usually pop them directly in a preheated oven to 150C for about 10 mins. Delicious and such good way to cook them up but keep them healthy! Wow, that looks soooo delicious! I will totally give them a try! 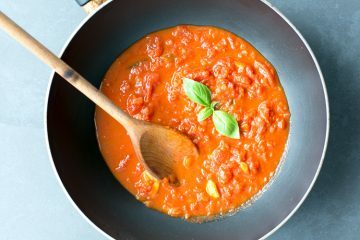 Do you have more vegetarian/vegan recipes? Thank you Alex! Hope you give them a try!